I just confirmed that the volume up button on the iPhone headphones works as a cable release for the iPhone camera. Should be an iOS5 thing so it doesn't have to be a 4S. I got a little iPhone tripod adapter last week so now I can make stop motion videos with my iPhone! Too bad the slideshow option in the phone has a minimum setting of 1 second or this would be pretty fun right inside the phone. It's mildly unsatisfying in iMovie, but quite amusing in GIFQuickMaker. The only thing I had in the house to play with is art that Ronnie Hinton made with the remnants of my former career. These are, unfortunately, not toys and I had to stop playing when I broke off a transistor hoof. 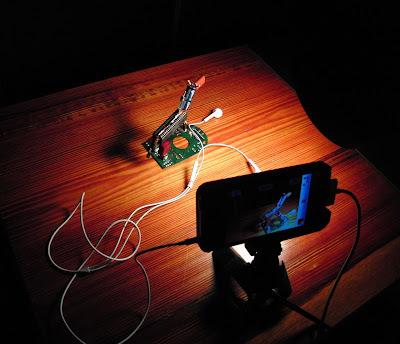 Update 3/5/2012: Studio Neat, the maker of my tripod adapter, made an app to make stop motion videos in-phone!